USC PAM offers a variety of classes and workshops throughout the year aimed at exploring Asian art and cultural practices. 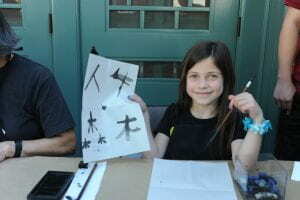 Longtime instructor Guang-Li (David) Zhang, a graduate of the Shanghai Art Academy teaches beginner and advanced students Chinese Calligraphy and Brushpainting in mixed lecture and workshop classes. Classes will not meet on February 2, 2019 (Lunar New Year), July 6, 2019 (Independence Day) or August 31, 2019 (Labor Day weekend). Sign-up for classes through Eventbrite. USC Pacific Asia Museum Members receive a 10% discount on class fees. Email bethany.wearden@pam.usc.edu for the discount code.